How It’s New York: Lúnasa piper Cilian Vallely is based here, (frequently to be seen at 11th Street); the band often plays here, and Highline Ballroom bounces between folk and urban downtown pop. Which is so New York. How It’s Irish: Kevin Crawford, the frontman of Lúnasa, whose new CD Carrying the Tune I rave about below, is a Clare man, though brought up in Birmingham, England. The music is Irish, as are the players, and, as Kevin explains, the melody is sacred, even if the arrangement isn’t (hello, double bass). Lúnasa plays Highline Ballroom in New York City on March 12th. A version of this article first appeared in Irish Examiner USA. 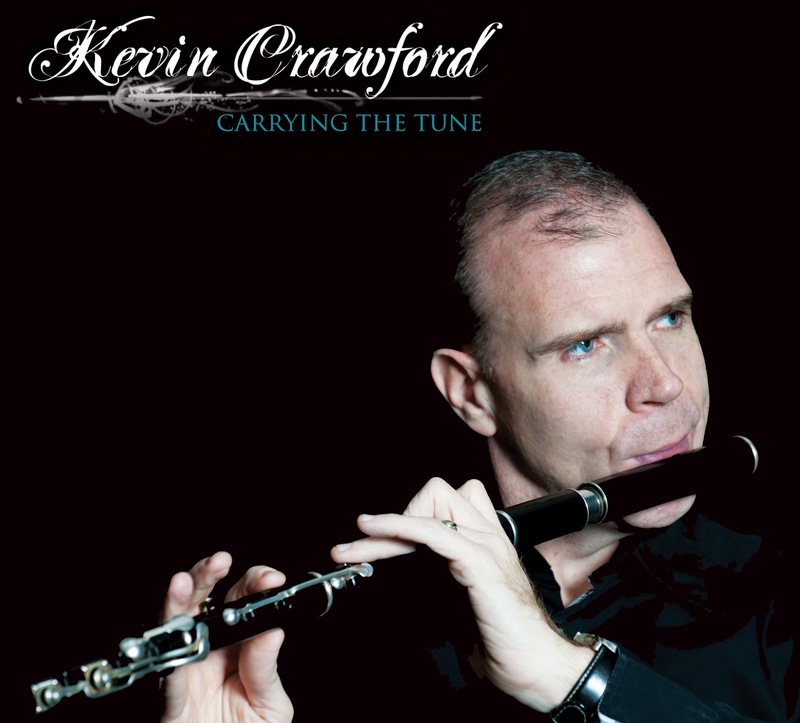 Carrying the Tune, the new solo CD by Lúnasa frontman, flutist Kevin Crawford, is “not for flute anoraks.” Well, that’s a relief. He and the band appear at Highline Ballroom on March 12th. This is not a CD just for purists; it’s for everyone. Carrying the Tune is insanely catchy. You can hear some of the tracks at Kevin’s website, and right now that’s the only place you can get it. By track two, a collection of slip jigs from Maurice Lennon and Donal Lunny, I’m grinning and swaying, on an hour of sleep. Part of that is John Doyle’s spirited, jaunty guitar driving the beat. But mainly it is the way Kevin plays on and around the melody. There’s tremendous life and variety, and sweet simplicity. If you dance, you’ll be on your feet. Track number four, a collection of waltzes beginning with “Flatwater Fran” by the Scottish accordion master Phil Cunningham, feels like the sun coming out. The 14 tracks fly by. You’ll have them on a loop. It’s always been a weird trick of Lúnasa that they’re one of the best bands going, yet they have no singer.When they play you forget about it, and you’re never bored. How do they do it? So what distinguishes a piece for Lúnasa, the five piece trad band that includes a double bass from Trevor Hutchinson, Seán Smyth on fiddle and whistles, Cillian Vallely on uillean pipe and whistles, and guitar player Ed Boyd, who recently joined the group, from a piece for Kevin? Lúnasa, named to honor the Celtic god Lugh, has had the words “jazz, rock and roll, bluegrass” thrown at it. All of the players are outstanding. Some tunes, like their version of Pierre Bensusan’s “The Last Pint,” could almost bring you to tears. The two slip jigs were offered to the band, but turned down – and as he says, their loss is his gain. What keeps Lúnasa traditional too, despite its instrumentation (you can’t call the double bass a trad instrument), is respect for the core of the music: the melody. Yet let’s be clear – the technical greatness is there, too. There are ornaments so fast and fluid they sound like a bird whistling in tune, and the transition between tunes in a set seems so smooth you can only picture Kevin turning purple as he keeps playing without breathing. There’s a beautiful intimacy to the sound of the CD, too. Tracks often begin with a couple of bars of John Doyle’s guitar. His energy and creativity “brought a whole other side of my playing that nobody else has done previously. I wanted this to be a little bit more in the moment, if you like.” He and John laid down the tracks live, and Kevin then chose the ones with the best energy, coloring them in later, sometimes adding harmony whistles, in a Lúnasa vein, or adding bodhrán from Brian Morrissey or bouzouki from his friend Mick Coneely. But there’s always the melody carrying you along. Kevin’s original tunes blend easily with the older trad tunes, and all are done with control and precision. Track 13, “The Hula Hoop,” is a jig called “Ray’s Revenge” that goes into the title reel. The reel was composed first, inspired by Kevin seeing his wife, sister in law and mother in law dancing and hula hoop-ing on the lawn, while he watched from inside. He tried to get the sense of hoops rising and falling in it. I hear it on a high note that has a sudden pause before the tune picks up again – the hoop dropped! In his home in Ballyogan, he says, there is an instrument every two feet, so that if a tune or a variation comes to him he can play it without losing it. “Ray’s Revenge” was written to honor a local man who beat him at the Snooker championships. Ray is a “slow burner,” coming from behind. The jig captures that sense of unassuming progress. Pairing the tunes was a hapy accident, Kevin says, when he realized the chords of the tunes go together. But the shift from jig to reel gives the tunes an electric energy jolt. The album includes traditional old melodies, including a lovely rendering of the slow air “The Dear Irish Boy” (which leads gradually into two sweet jigs). Some tunes come from pipers and whistle players, including Pat McNulty, Paddy O’Brien; “The Mountain Lark” he got from fiddler P.J. Hayes. Others are tunes Kevin has collected, including a jig from Leitrim flute player and New York fireman John McKenna. Kevin learned about McKenna when Lúnasa had a residency in County Leitrim in 2007. Over 18 months, as the band visited 10 times, Kevin immersed himself in the staccato, choppy style there. A 2-CD project, Leitrim Equation, came out of that (it can be purchased at the Leitrim Equation website). McKenna, he learned, left for the states in the early part of the 20th century. His recordings from 1920-1935 helped rekindle interest in the music back home. His mother took the children to Ireland every summer. At home, he listened fanatically to the Tulla Ceili band, the Kilfenora band, P.J. Hayes and Paddy Kenny. Before long a year had gone by, and he called his mother to send the rest of his things. He worked day jobs, on a dairy farm, at a hifi store. In 1994 the group Moving Cloud asked him to join, and in 1997 he was asked to join a new band called Lúnasa. Since then he’s gone on carrying the tune with him. And sharing the melody with us. Lúnasa are at Highline Ballroom on March 12.